It got us thinking about how many people move into a new home with an alarm already installed, that aren’t really sure how to use it properly? Moving day is usually pretty manic; you often don’t even see anyone who may be able to show you such as the previous owners/landlord/estate agent and even if you do, it may be the last thing you think to ask with everything else that’s going on. If you’re lucky you may be left some brief instructions or a user manual but these may not be all that easy to get to grips with. Usually you will at least be given the alarm code but sometimes you don’t even get this. The outcome is often that you have a burglar alarm that you are not able to take full advantage of, if indeed you can use it at all. This makes no sense; it’s like not bothering to lock the house because you haven’t got a pocket to put your keys in. Even if you have figured out how to set it when you go out, there could be a range of functions that you’re not able to access. Luckily this is a simple issue to resolve. In this situation, the best thing you can do is to get the alarm serviced. 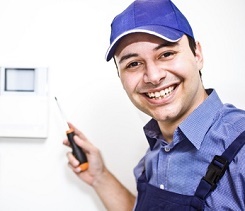 Not only will a service ensure that the alarm is in good working order and has a battery with a prescribed level of charge, the engineer can do a number of useful things including changing the code (always a good security precaution), checking that all the sensors are working properly and, if required, swapping them for pet sensors, programming additional fobs/cards and showing you how to use the alarm including full and partial sets and controlling anything else within the capabilities of the system (eg speech dialler, remote set etc). This is what we did for the gentleman who left the review and he now has an alarm that he can use to its full capabilities. If you have an alarm that you’re not using properly, for whatever reason, then why not get us out to give it a full service to get it working and get you up to speed on using it. Give us a call on 0345 833 5543 or send us a message. next How do you prevent false fire alarms?